Daily Illuminator: Hey Look: Rules! April 20, 2011: Hey Look: Rules! 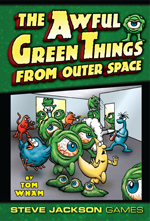 The latest edition of Awful Green Things from Outer Space should be landing in a week or two. Each game will then need to be broken down into component molecules and beamed to your friendly local game store . . . a process which takes a couple weeks. I know, you thought "beaming" was instant; don't believe everything you see on TV. In the meantime, here are the rules as a handy PDF. We even included the comics, just as they originally appeared. Actually, we colored them, so they look even better!